Maintenance Worker and Warehouseman There are 13 products. 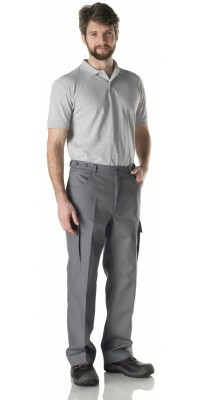 Maintenance men's trousers with side pockets adjustable waistGrey colourImmediately available for delivery: sizes from S to XL Made of Vulcan Gabardine, 60% Cot., 40% Pol. Maintenance men's green Dungarees Overalls with a big pocket in the middle of the bibGrey colourImmediately available for delivery: sizes from S to XL Made of Vulcan Gabardine, 60% Cot., 40% Pol. Maintenance men's lightweight Dungarees Overalls, ideal for summer with a big pocket in the middle of the bibNavy Blue colourImmediately available for delivery: sizes from S to XL Made of Remy Gabardine, 65% Pol. 35% Cot. Maintenance men's trousers with side pockets adjustable waist - lightweight, ideal for summerNavy Blue colourImmediately available for delivery: sizes from S to XL Made of Remy Gabardine, 65% Pol. 35% Cot. Maintenance men's shirt long-sleevedSky-blue colourImmediately available for delivery: sizes from S to XL Made of Oxford, 75% Cot., 25% Pol. Multipocket vest, model Reporter zipper on the frontNavy Blue colourImmediately available for delivery: sizes from M to XL Made of 65% Pol., 35% Cot.